Our winemaking philosophy can be summarized as “…creating the very best wine from the vintage we’ve been given; to take what we get from the vineyard and to express the terroir and the uniqueness of the vineyard in every bottle of wine.” We strive to pick our grapes at that ephemeral moment when they have the most to give. We try to steer the fermentation in a direction we believe reflects the inherent grape characteristics, the soil they are grown in and the weather of a particular year. To achieve that we believe in interfering as little as possible into the fermentation process. While chemical analysis of must and wine is helpful, it is ultimately our senses and intuition that define our choices. Although we stay away from chemical tools in the winemaking process, we do influence the fermentation dynamics (and the resulting extraction of grape compounds into the wine) through physical processes like temperature control, intensity of crushing, frequency of punch-downs and pump-overs, length of maceration time, etc. 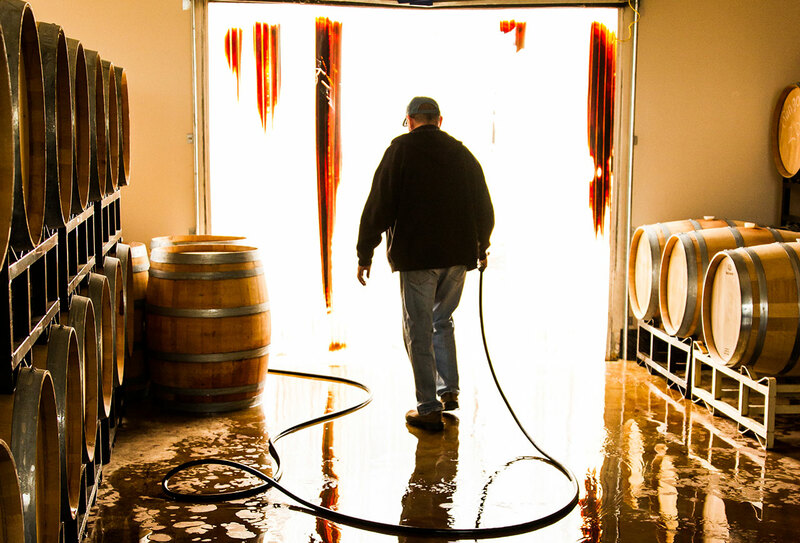 During the aging process we respect the integrity of the grapes by integrating oak flavors and tannins by selecting barrels that have only a subtle impact in the flavor outcome of the wine. As such some of our wines showcase a unique site in the vineyard while others reflect the influence of a certain clone or a winemaking technique like whole cluster fermentation. All are given the same care and attention. All are intended to give a pleasure that is hopefully as cerebral as it is physical. After all, with every bottle sold there is a part of us in it. When you open one of our bottles not only will you taste wine, but will also possess our dreams, energy, hours of labor, love for the land and lessons learned from previous generations of winemakers in our family. Cheers!